I know, I’ve been a bad blogger lately….those of you who have followed me for awhile here, or follow me on twitter will know I have lupus. It comes and goes and has been rather active lately meaning I’ve just had no energy for baking/cooking etc… I’m sure I’ll be back in the kitchen soon but until then I was asked by the super lovely Mangocheeks over at Allotment to Kitchen to participate in a Photo Meme. Like her I don’t usually do these as I like to keep my blog just recipes but as this one included a photo I just couldn’t resist! Plus, with me having nothing to blog about these days it was a perfect time! So, which photo???? That was hard but my first reaction was something from my childhood. Now, living over here I don’t have many childhood pictures so called my parents who scanned and e-mailed a few over. I knew this was the one as soon as I opened it. 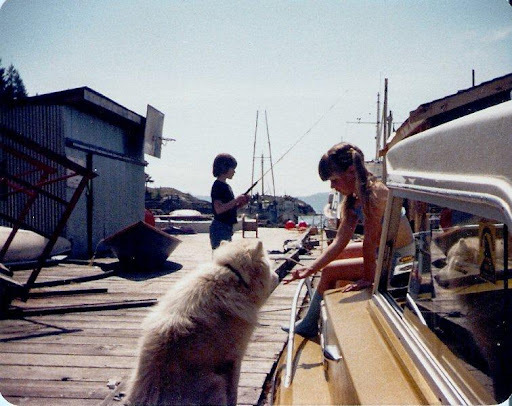 I grew up on the west coast of Canada and every summer we would head up the coast in our boat, often staying over night in unbelievably gorgeous locations. I have the best memories from these trips, especially whenever we would stay in Refuge Cove , where that photo is taken. I’m on the boat there playing with ‘Toba’ - he was the resident dog there and would always come running up to our boat when we docked. I LOVED that dog, him and copious amounts of sweets from the little shop there what I looked forward to the most! My brother is in the background there fishing and I’m thinking I’m about 7 or 8 here, making this around 1980/1981? It was fun thinking of which photo to use and looking at old pics – thanks for thinking of me for this one Mangocheeks!! 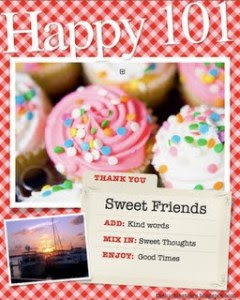 "List 10 things that make you happy, try to do at least one of them today, and tag 10 bloggers that brighten your day. For those 10 bloggers who get the award, you must link back to my blog!" 1. Going ‘home’ to Canada for holidays – last time was 3 years ago, don’t get to go often so it’s a treasure when we do! 2. Walking my son to school – it’s a half hour walk and just a nice quiet time with him to chat. 4. Cooking and Baking – obviously!! 5. A slice of cake and a cup of coffee – simply the best! 7. Eating out in restaurants – either vegan or with fantastic vegan options. 8.Opening a nice bottle of red and staying in watching a movie with the husband. 9. Road Trips – still love them! Thank you so much for participating Debbie. I love your choice of photo. It made me smile that you got your parents to scan and e mail it to you. I understand why. I enjoyed reading your memories behind the photograph too. I hope you get some energy to get back in the kitchen and create some culinary delights. Simple or complicated, I am always impressed and inspired.